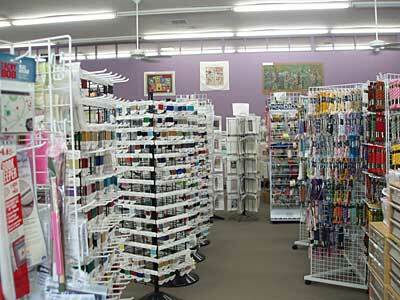 Located on a busy street in Alameda, a town teeming with activity, shops, cafés, bakeries, farmer’s markets, and so forth, Needle in a Haystack is a large, open, airy shop filled with all kinds of delightful things for the needleworker. 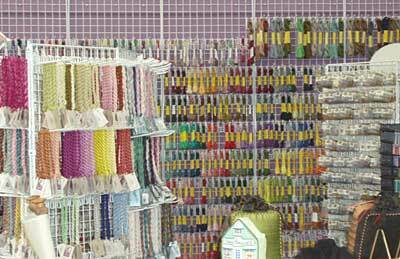 I’d say that, out of the four shops I visited, the Haystack has the largest space devoted solely to needlework supplies. It’s probably comparable in size to Nordic Needle, but the floor area is not as broken up as Nordic Needle’s is. 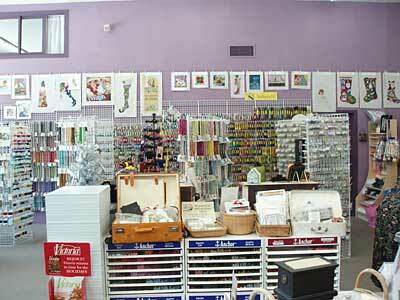 With lots of floor space and a very open layout, it is a very pleasant place to shop. In the front of the store, tables and chairs invite the stitcher to sit a bit to match threads or to flip through books and so forth. The area is used for classes and stitching groups. 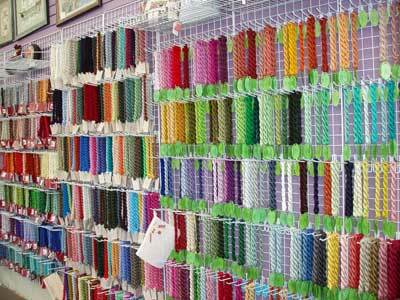 Much of the wall space of the store is covered with threads – lots of threads! In addition to threads, you’ll find shelves tastefully arranged with displays of accessories, books, and needlework-related items. Above the threads along the walls, you’ll find heaps of hand painted canvases for needlepoint, including some very enticing historical adaptations of tapestries and slips and whatnot. What I really liked about Haystack was the variety of embroidery techniques represented by their merchandise. I found some beautiful crewel and needlepainting kits, many books / magazines on cutwork and whitework, fabric for surface embroidery of all types, as well as a vast selection of counted thread charts, historical samplers, blackwork, and needlepoint / canvas work supplies. There was more variety here, as far as specific stitching techniques are concerned, than in any other store I visited. Merchandise: a variety of merchandise is offered for stitchers interested in different techniques. They pretty much have everything, and if, by chance, there’s something you want that they don’t have, they’ll order it. They have the full range of Au Ver a Soie products, by the way, if you’re looking for silk, among other types of silks and blends. Layout of the Shop: Most pleasant – open, airy, easy to find things and relaxing for casual browsing, even when the shop is busy with customers. Prices: Well. I have to admit, their prices for things that can be bought elsewhere are slightly higher than many online or brick-and-mortar shops. However, it’s always worthwhile to keep an eye out for their specials, by subscribing to their newsletter and frequenting their blog. Service: Very good – the people working are friendly, knowledgeable, and talkative and can help you find anything or make decisions on thread choices, etc. They’re also very helpful when it comes to local information, goings-on, and so forth. So … in a nutshell… yes, I loved Needle in a Haystack. They have a great online store, too, so if you can’t make it to their shop, check them out online! As far as online shops go, they’re layout is really nice, too. I like ordering from them, simply for the ease of ordering. 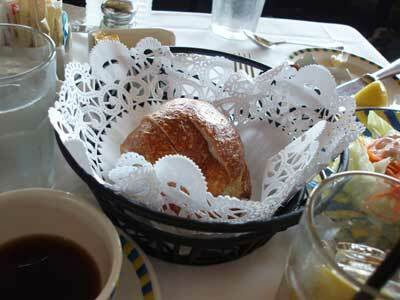 We did non-needlework-related stuff in the San Francisco Bay area, too, by the way. In fact, my family used to live in every place we visited on the West Coast! So, while we were up in the Seattle area, we found the house my folks lived in on Whidby Island. In Alameda, we used to live on Burbank Street, which is still lined with very tall palm trees. Also in the area, we lived in a “modern” Eichler home up on Phaeton Drive in Oakland (and the house still looks great! ), and we also lived in Walnut Creek for a while, so we looked for that house, too, and the school we attended as children. We didn’t always have luck finding our former homes – in Monterey, for example, the house is no longer there. 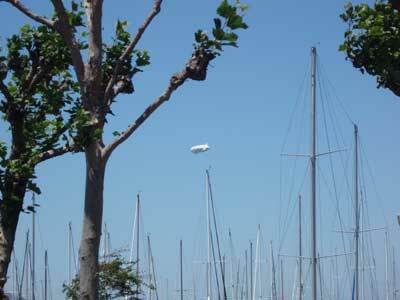 Driving into the city of San Francisco, we saw a blimp hovering overhead. I had to take a picture – as a kid, we always looked for the blimp! And it’s still there! 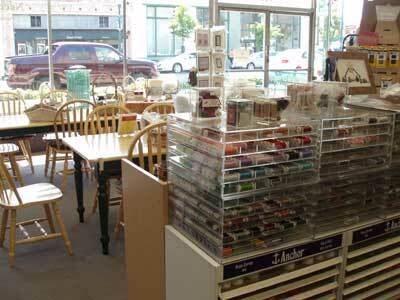 Before we left the San Francisco area, I did manage to make it to Lacis, which was my last needlework shop on the trip. 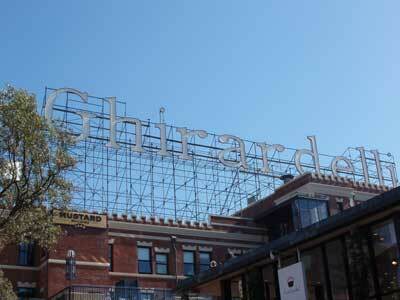 It’s a weirdly wonderful place, so I’ll tell you about that one next! It looks like you had a beautiful, exciting trip! I live in Southern California and have been wanting to make the trip up to San Francisco for awhile. I will have to do it now that I've been enticed by your photos and reviews of the needlework shops up there. That's no blimp, it's a Zeppelin! Here's their website, if you want more info- I swear if I win the lottery, a cruise on this thing is my first purchase. We see it rather often when I'm taking my husband into work and it never fails to intrigue me. 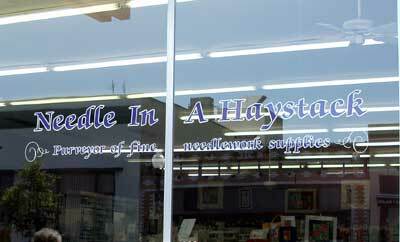 Needle in a Haystack is one of my favorite visited shops in the Bay Area. They seem to have just about everything including well-informed sales staff. I'm looking forward to your observations on Lacis. I think I spent 4 hours in there on my first visit, didn't see everything there was on offer, and came away feeling a bit "stuffed". I envy you for the places that you have visited. Its very nice of you to share the pictures. Gives me a feeling that i m travelling to the same place. Does any one know of such places in India too?